Love Saves the World: Happy Release Day! The Baron and the Mistress by Karyn Gerrard! Happy Release Day! 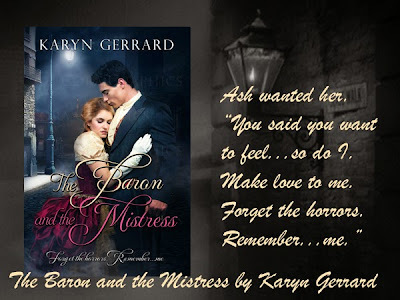 The Baron and the Mistress by Karyn Gerrard! Forget the horrors. Remember ... me. Chastity could not believe she allowed the well-dressed gentleman to take her away in his carriage. They did not go far nor did they speak during the short journey. They both sat in a private room at The Pig and Whistle tavern. Her stomach rumbled. The man, who introduced himself as Ash and insisted she call him by that name, ordered beef stew, ale, and extra bread and cheese. Fifteen shillings? The obscene amount still rattled about in her bewildered brain. With proper planning the money would keep her and her brother and sister comfortable for some weeks. What in God’s name did he wish to do with her? Or to her? What perverse act would she be subjected to? His intense stare made her uncomfortable. This Ash was too handsome by far. After removing his hat and gloves, he ran his hand through his black-as-midnight hair. His eyes were the color of a fine cognac and the gleam of lust that shone from them sent waves of heat through her body. Ash removed his cloak. The silver lining appeared to be the finest silk. His tall frame was perfectly proportioned and how well it filled out the excellently tailored evening wear. A smartly tied silver cravat about his neck completed the look and he did look every inch the rake. Chastity caught a whiff of expensive cologne. 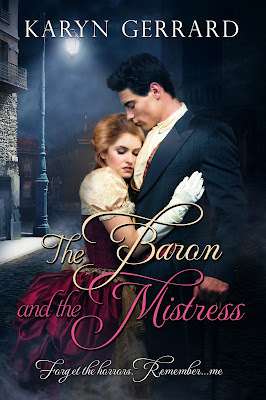 The scent of bergamot and lemon invaded her nostrils. Her stomach dipped precipitously. Dear heaven, I find him attractive? Not wise. Chastity’s gaze darted about the small room trying to find a quick escape route. Chastity’s cheeks burned in humiliation. Before she could answer, the door burst open and the barmaid carried in a tray of foodstuffs. The tantalizing aroma of beef, grilled onions, and fresh bread made her salivate. For a meal such as this and fifteen shillings, she would agree to anything. And she would bet this arrogant, handsome man knew it.